If you’ve been reading Ferretbrain for a particularly long time you might remember that I’ve waxed enthusiastic in the past about the Vlad Taltos series by Steven Brust once or twice. 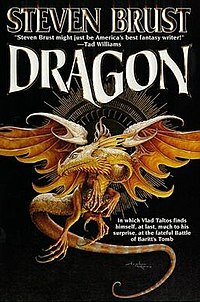 I’m sorry to report that Dragon, the eighth book in the series might be the breaking point: whereas the seven previous volumes managed to be tightly-written sword and sorcery adventures with a Mafioso twist written in a style reminiscent of Hammett and Leiber and with each book both providing a fresh twist on the formula and adding something to the continuing story of Vlad’s life, the eighth book is an occasionally-sloppy sword and sorcery adventure with the organised crime element almost entirely absent and which doesn’t seem particularly relevant to the bulk of the story. Perhaps part of the apparent irrelevance is the fact that Dragon jumps back in the timeline a fair way, to a point before Vlad got married and before he quit the fantasy Mafia and went on the run. Granted, this has happened previously in the series (as in Taltos, which is the fourth book in the series but details Vlad’s earliest adventures), but each time this has been to chronicle an incident which had been referred to in previous books and was clearly always part of the timeline. 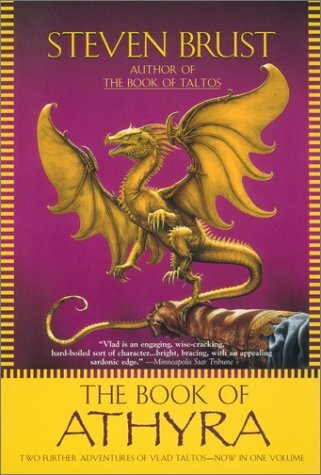 Not so with Dragon; I don’t remember any other books where Taltos reminisced about the time he joined his warlord buddy’s army in order to co-ordinate sneak attacks and recover a stolen magic sword. The Book of Athyra, containing Athyra and Orca, the 6th and 7th books in Steven Brust’s Vlad Taltos series, is the final third and final compilation of books from the series to be released by Ace/Berkeley. 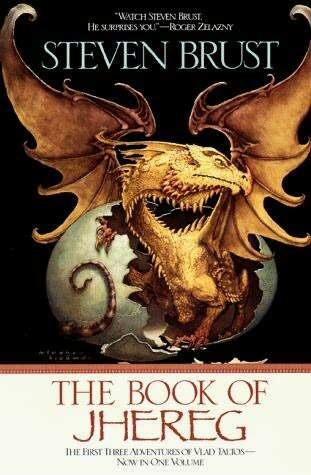 (Later books in the series are published by Tor Books, and so further compilations are not expected.) I’ve already reviewed the first two compilations elsewhere on Ferretbrain, and if you’ve not read them yet and would prefer it if I didn’t give you spoilers, I don’t really have much to add. While the first two compilations could stand on their own as a reasonably complete series, books 6 and 7 succeed in redefining Vlad’s character in a new context, injecting new life into the saga, and delivering some exicting stories to boot. While it is still within Brust’s power to utterly ruin the series, I’m inclined to trust him for now. For those of you who have read the first two compilations – or don’t mind spoilers for books 1-5 – the rest of this article is for you. Steven Brust has set a difficult challenge for himself: his Vlad Taltos series, his best-known work and arguably his magnum opus, currently extends to ten books – slim volumes of 200 pages each, admittedly, as opposed to bloated Wheel of Time-sized bricks, admittedly, but that’s still an impressive amount of wordage. 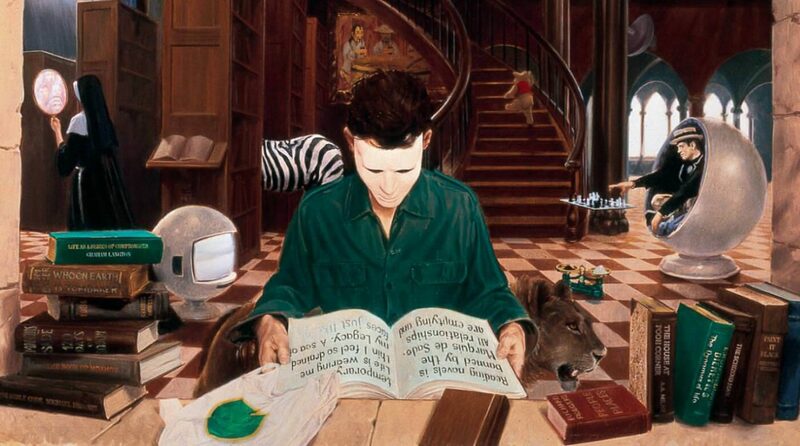 The series is supposed to – once it’s finished – comprise nineteen volumes. A 3800 page fantasy series has got to be tough reading, right? Well, I’ve just finished reading the first thousand-or-so pages of the story – the first five novels, in other words – and it’s looking good so far. Brust strives to make each book as standalone as possible – while you don’t need to have read any of the other books in the series to enjoy the others, reading them in order of publication (which also happens to be the order in which they are compiled) is perhaps the best way to experience them. I say “order of publication” because assigning a strict chronological order to the stories is difficult – for example, Taltos, the fourth volume, is the earliest story in the timeline.